But if you try sometimes, you can get what you need. Sorry, Mick. I beg to differ. This holiday you can get what you want and what you need. (For we smoke and fire addicts the two are often synonymous.) Here’s BarbecueBible.com’s annual compilation of the tools, fuels, gadgets, and other gifts guaranteed to thrill the barbecuer in your life. Permission granted to print it out and distribute it to people who might need a cheat sheet for you. And, nah, we’re not against gifting yourself. 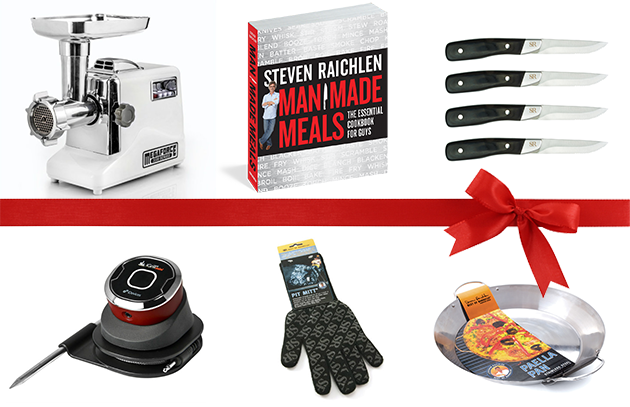 To up the ante this year, we’re giving away one Barbecuer’s Dream Gift Package full of more items guaranteed to thrill. As any veteran of a long cook can tell you, temperature control is the hardest thing to master when burning wood or charcoal. There are just too many variables, weather not least among them. Enter the BBQ Guru PartyQ heat regulation system. 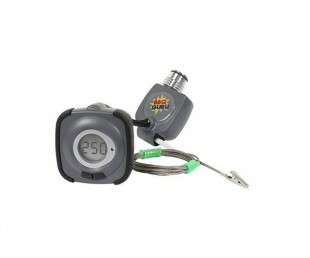 Clip the pit probe to the grill grate, attach the controller to the damper, set the temperature between 32 and 475 degrees F, and relax. The unit’s battery-powered draft technology system will take it from there, fanning the flames as needed. Great for night burns and no hourly wakeups required. If steak is the caveman’s meat of choice (yeah, we know how you feel about my caveman T-bone), these homicidally sharp steak knives are your weapon. 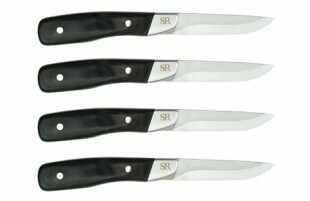 Handsome and heavy, these forged stainless steel knives with polished pakkawood handles glide through any steak like butter. Pair them with premium steaks, my Best of Barbecue Steak Rub and a bottle of my Best of Barbecue Steak Sauce for a gift that will thrill the inner carnivore in anyone. Yes, it has a big footprint. No, if you (or someone on your gift list) makes his own bacon and pastrami, you shouldn’t be without it. Made by the well-known company Chef’s Choice, this rugged electric meat slicer handles smoked ham, salami, pork belly, and other cured meats like a champ. 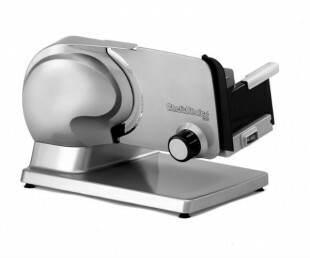 Its adjustable blade can slice paper-thin, or up to 3/4 inch thick. Here it is—the take-no-prisoners grill brush you’ve seen me use on TV. 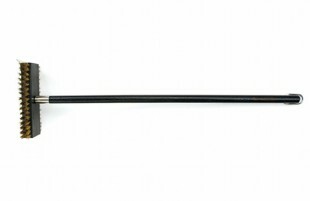 But it’s now newly improved with a unique twisted bristle design that virtually eliminates the risk of finding a stray grill brush bristle in your food. Use the stainless steel bristle side to scour cast iron or stainless grates; clean delicate porcelainized enamel with the brass side. Remember the mantra: Keep it hot, keep it clean, keep it lubricated. I’ve always advised grillers never to desert their posts. But with this vigilant iGrill Mini, you can monitor food temperatures from up to 150 feet away. 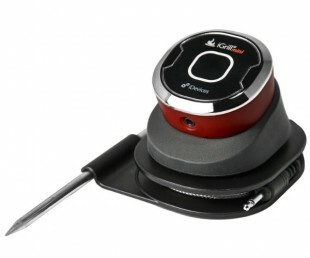 The iGrill Mini connects via Bluetooth to compatible mobile devices and reacts with an alarm to preset temperatures. Runs on a single coin cell battery. Now about that holiday football game. . . . 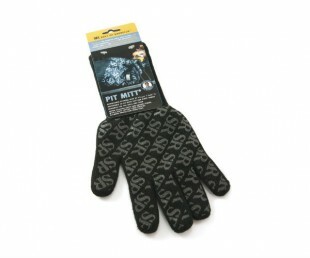 When it comes to hand protection, we take our cue from professional firefighters. Woven from Aramid fibers (yes, the same material used by the aerospace industry), our new pit mitt withstands temperatures of up to 425 degrees. Wear it when lighting chimney starters and handling hot grilling planks, grill presses, and salt slabs. Soft cotton interior with long sleeves to protect your arm, and silicon grips on the palm. Makes a great stocking stuffer. 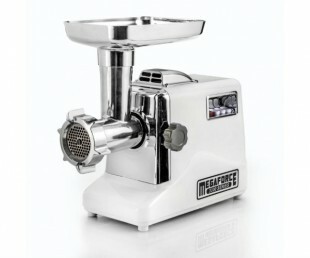 Here’s a serious meat grinder for the griller or smoker interested in making custom ground meat blends, sausages, or charcuterie at home. The cast aluminum unit comes standard with a #12 grinding head as well as three hardened steel grinding plates (coarse, medium, and fine), a special sausage stuffing plate, three stainless steel cutting blades, and three sausage stuffing tubes and adapters. A patented cooling system keeps the machine from overheating during arduous grinding sessions. Comes with a three-year warranty. Just remember to post photos of the best of your wurst. The title says it all: Man Made Meals is a manifesto on the skills, tools, and techniques every guy needs to know to dazzle a date or spouse, impress guests, or feed a family. 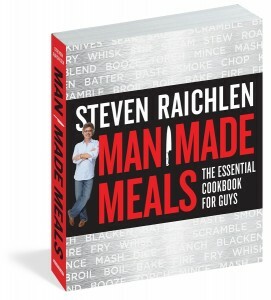 With over 300 recipes and insightful interviews with men who cook (“Food Dudes”). Actor and major foodie Stanley Tucci summed it up this way: “Another great book from a master. Its scope is as staggering as its attention to detail. A must have for every fellow who loves to cook or has just dreamed of cooking.” That means you. In Spain, it’s guy food and it’s traditionally cooked on over a wood fire outdoors. I speak, of course, of paella—Spain’s great gift to the world of rice. Sure you could bake it in the oven, but you’d miss the eye-popping sizzle of sofrito over a fire and the haunting scent of wood smoke. 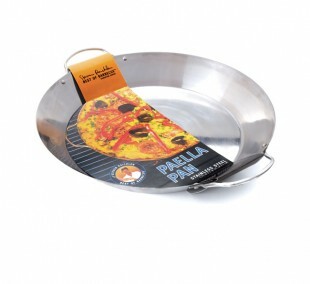 Our paella pan is stainless steel, so it takes kindly to the high heat and vigorous spoon. Go old school with rabbit and snails or new school with chicken and seafood. Had it with “stuff”? An experience is one of the most treasured gifts you can give. 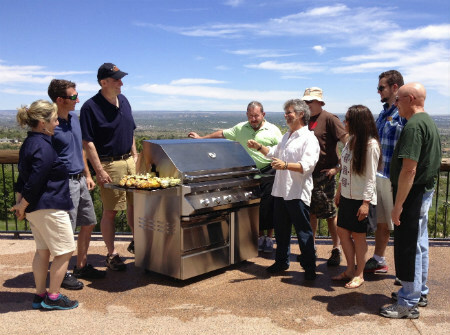 And there is no experience quite like Barbecue University™—a three-day extravaganza of food and fire at the posh Broadmoor in Colorado Springs. There’s still space in our June 3–7 and June 7–10 sessions (but not much)—each limited to 55 people. This year’s theme is “Up in Smoke,” also the title of my next book. Cooking Light magazine likened it to “a fantasy camp for coalheads.” Learn more about this exclusive learning experience here.